Now maybe he can complete the book with the next edition and include the Griqua coins. "The truth is like a lion. You don't have to defend it. Let it loose and it will defend itself." "Morgan the Brave" really wants to include a section on the original GQT coins - as well as South African shipwreck coins. Unfortunately, I am too busy at work and he has yet to find somebody else to assist him in this. This will be a good step forward for South African numismatics.Any takers ? I can put you in contact with him via email. No need Mike. The website was developed and registered by Scott Balson. https://sixstat.com/ratings-reviews/coinsrsa.com/ The website will be a good starting point for including all of history. exclusion of the Griquatown tokens as they never circulated nor ever used as money in South Africa. They have no numismatic value. Damn, how could I have missed this fascinating revelation?! This just doesn't make sense to me as my understanding is that MTB wants to include a section on the 1815-1816 GQT coins in his handbook. 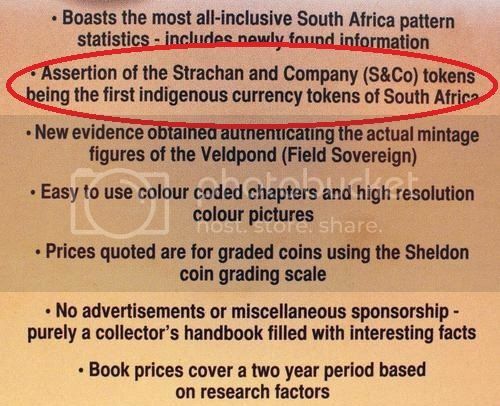 Makes sense, as my impression is that the mainstream of South African numismatists- and the South African Reserve Bank - appear to recognise that the 1815-1816 GQT coins have far greater significance to South African numismatic history than the S&Co tokens. Whatever might be on the website Cold Sea refers to, the fact is that the intellectual property of MTB resides in MTB's printed handbook, so a website by anybody else simply serves to propagate the views of the person to whom the website is registered and the information contained therein will be channelled towards the opinions of that same person. Hi Mike, as MTB is the author of the printed handbook, he is free to include or exclude anything he wants. This just means that the book is not as complete as others and may not be a first choice for many. As for the website. The website I am referring to is under the banner of MTB. I will be very surprised to learn that MTB had no knowledge of the website and not given consent to the contents thereof. If the GQT coins are to be included in the next edition (every two years according to the site), then, as I have mentioned, the website should be changed to reflect this. This as you say will be a good step forward for numismatics. If the website has nothing to do with MTB, then it should be taken down. Morgan the Brave is a standup guy who I have always respected. . I have said this on this forum, to anyone with any numismatic interest when discussing his kind numismatic patronage, and also in private correspondence between the two of us. He is currently in the process of sponsoring a book being written on the token coinage of South Africa. I have gladly accepted his invitation to write a chapter on the Griqua coinage - actually a repeat of my The TRUTH behind the Griqua Coinage, but then informed him that I have retracted my decision on hearing who some of the other contributors will be. I was not informed, or received any feedback from anyone, that the MTB Pocket Guide website was being run from an Australian address in Brisbane. O my word - I have just been forwarded this correspondence from a friend in Johannesburg - please read the whole thread until the 3rd page (there are three pages). "The greatest part of the Griqua money is still in our Societys property which Br Anderson when leaving delivered to my care. As Mr Campbell thought that Br Anderson had dispersed the silver pieces at too cheap rate, I asked him to let me know the real value of a piece of each which he promised to do, but I have as yet received no account and it is therefore still in my possession. I should be glad if you, dear sir, would have the goodness to inform me what I am to do with it. Regarding the coincommunity revelation - see link above - Who ever Karel is who posted there - he did South African Numismatics so proud! Almost unbelievable - give that man a Bells! Balson apparently "set traps" on his website by deliberately spelling some words wrong, but has now been caught out by old screen-shots of his site showing that the words have always been spelled that way since way back when. Now that the trap-setter himself has been caught out, he changes the words on his website. He actually fell into his own trap. I think that Karel deserves more than a Bells. I think that of particular importance is what Karel had to say on the 3rd of March 2016 on the Coin Community forum (in bold blue). Mr Balson wrote "In the PDF linked in the first post the resident missionary Helm asks the London Missionary Society in 1821 what he should do with the uncirculated Griquatown tokens." Campbell thought that Br Anderson had dispersed the silver pieces at too cheap rate,..."
My understanding of this is that some of the coins were dispersed at a particular exchange rate, which means two things. One is that they were circulated and two as a medium of currency. 1." The 1815-1816 GQT pieces were not coins - merely tokens". Helm, in 1821 - which is as contemporary as it can get - regards the pieces in his possession as money. How can somebody 190 years later argue otherwise....? Also, did Helm write "tokens" or "money"? If it was "money", then by what license does anybody else have to use a completely different word ("tokens") from money? Lastly, there is nothing to indicate that Helm did not have copper 1/4 and 1/2 pence pieces as well as the silver (5 pence and 10 pence) pieces. However, only the silver pieces are referred to by Helm because Helm was concerned that these silver pieces had been circulated/dispersed too cheaply. Thank you, Karel, whoever you are. Mr, Balson, I have noticed that you have made more changes to your opinion piece http://www.tokencoins.com/helm.htm without altering the date. I take it this was done unintentionally. I am wondering if there are any other deliberate typos or errors in any of your pieces that the forum should know of. Helm actually wrote preachers but the trap-setter thought preaches was a good trap. Helm actually wrote cheap a rate but the trap setter thought cheap rate would be a good trap. It is very strange that these traps were not mentioned when he edited his website on 21 Feb 2016. So i decided to get the MTB catalogue myself and see what it is all about, it so happened that when i ordered my copy Morgan was in the same city and phoned me to bring me a signed copy, we had a great chat and i must say he really is a great guy with a wealth of knowledge, The book contains good color photographs, is well set out and easy to understand.I like the fact that prices are set up in $ as this makes tracking item values on international Auctions much easier I can highly recommend it for coin collectors. Thank you Morgan for popping in and well done on a fantastic book. Hi Mike, as MTB is the author of the printed handbook, he is free to include or exclude anything he wants. This just means that the book is not as complete as others and may not be a first choice for many. As for the website. The website I am referring to is under the banner of MTB. I will be very surprised to learn that MTB had no knowledge of the website and not given consent to the contents thereof. I was thinking about this during the past few weeks on holiday. Our friend in Australia uses his website to belittle Herns South African Coin & Pattern Catalogue which is the standard work on South African coins. He states that the Hern catalogue is full of fallacies and mistakes and is old and outdated. He has also attacked many other South African numismatists including Peter Wilson (the President of the National Numismatic Society). He says that these two men at the National Numismatic Society (Hern and Wilson) have used these positions to further THEIR own interests. So Hern's SA Coin Catalogue is rubbished but then in the same breath he promotes far and wide that the MTB pocket guide is the holey grail regarding SA Numismatics. Why does Morgan Carroll not just simply refute this and say that the Australian website has nothing to do with him? All of us sometimes end up being locked into a contract, arrangement, or situation which - during the course of time - we might find we are not comfortable. We bear it as long as is permissible, then we move into better waters. I think that it is perhaps unfair on MTB to condemn him for his association with our Australian friend. I believe that MTB has his own mind and that his path in South African numismatics will, in the future, veer markedly more towards the mainstream of thinking of South African numismatists (spearheaded by Hern and Wilson) and the South African Reserve Bank re the GQT 1815-1816 coinage. To be fair, let MTB carry on and let us judge him on his future works. I agree 100% with you Mike. The more I think about it, the more I believe that Morgan has no say in the way the Australian website is run. Although the Australian website supposedly "supports" his Pocket Guide, it actually is used as a launching pad to vilify and belittle the bastions of South African Numismatics. And the worst of it all is that many people are now apprehensive in buying the MTB Pocket Guide because of its association with these cancerous attacks from Down Under. Morgan is currently caught between a rock and a hard place, and I really think he needs the support of us all in making a crucial decision. Word has reached me that Morgan the Brave (editor of the new Pocket Guide on SA Coins) and his un-asked-for webmaster in Australia have separated their ways. Morgan could not stand the attacks on our South African Numismatic Stalwarts anymore and showed the relentless attacker the back door. If this is true, we all salute you Morgan.